PARTNERS – Protecting The Environment is an opportunity! In Veikkola school there are 700 pupils, aged 7-16, and 60 teachers. 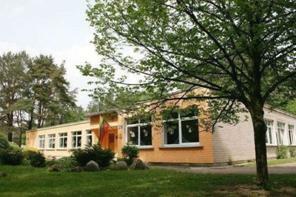 The school is situated in northern Kirkkonummi 30 km from our capital Helsinki. 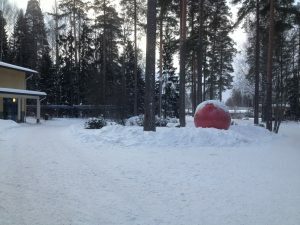 In Veikkola village there are 5,000 inhabitants. 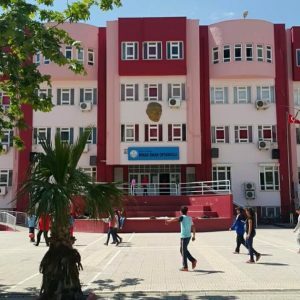 The main priorities of our school are internationality, entrepreneurship and being a community where every pupil and teacher has his/her own, important role while working together towards a common goal. At the moment we are part of two Erasmus+ projects: Protecting the environment is an opportunity!Not a burden we must bear and Handy hands together in Finland, Estonia and Latvia. In addition we have various other international projects, such as co-operation with Japanese and American schools. 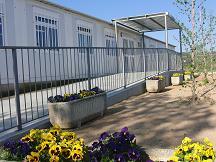 Our school is situated in Radeberg near Dresden – the capital of Saxony. It lies in the middle of the town centre. In Radeberg live about 18.000 inhabitants. Radeberg is famous for its beer. The secondary school is a general school open for all kinds of pupils who want to reach a GCSE. There are secondary modern classes (class 7-9) and secondary classes (from 7-10). Classes 5 and 6 constitute a phase of particular support, supervision and orientation with regards to the pupil’s future educational path and its particular direction. All students learn English at school as their first foreign language. About one third of our students learn French as their second foreign language. Some of our pupils come from families with a disadvantaged social background. There are also opportunities for challenged (disabled) pupils and children with behavioral disorders as well to be integrated at Pestalozzi School. It’s a big day-to-day challenge for us providing the best possible conditions in learning for every single pupil notwithstanding its social background. Our institution will act as the coordinator in this project. We are looking forward to host our partners during the meetings here in Radeberg. Our school has been dealing with environmental issues for a long time, especially with water pollution in our area. Thus we want to share our experiences in this new common project. 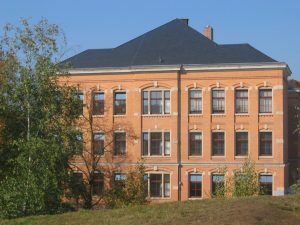 LITHUANIA – Kauno Versvu Vidurine Mokykla: School type – general education secondary school.Our school has 3 buildings with 750 students, aged 7-18, and 61 teachers. 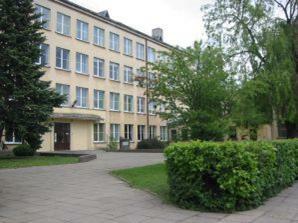 This is our main school building, and there are students from 11- 18 years old. The original school building newly renovated. The school has warm and cozy classrooms. This is a primary school.The school has a dining room, library, 2 sports halls and dance, computer class.There is a supervised study centre as well. There pupils can do homework, play games. 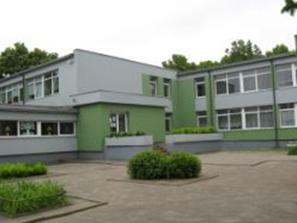 Primary school building is in Romainiai. Children learn in the small and comfortable classrooms.The school has an extended day group.Students might choose the singing, dancing, sports, art classes. Kaunas is the second-largest city in Lithuania with 583,000 habitants. It is located in the centre of Lithuania, at the confluence of the two largest Lithuanian rivers, the Nemunas and the Neris and near the Kaunas Reservoir, the largest body of water entirely in Lithuania. To improve the educational process and the development of students‘ general and specific competences. To improve English communicating skills. To know the country‘s cultural heritage, diversity. To protect the environment and conserve its resources. First, promoting trilingualism (Catalan, Spanish and English) and the ICT skills. Secondly, promoting a high-qualified education with an European dimension, taking part in partnerships.Thirdly, catering for the diversity of learning abilities and motivations, not only for achieving the basic competences but also excellence. Regarding European projects, La Miquela is a leading school in Spain. From the very beginning, 2010-2011, the centre has carried out four European projects as well as several exchanges with Italy and Holland. This year, we have started two Erasmus + projects: Protecting the environment is an opportunity!Not a burden we must bear and Time Banking 2.0. First promoting bilingualism (Turkish, English). Secondly, promoting a high-qualified education an European dimension , taking part in partnership. This year we held the second Maths and Science Olympic at school. In our country Maths and Science Olympic hold only by private colleges but our school is the first to hold it. So we will go on Project year by year. Regarding European Project “protecting the is an opportunity! Not a burden we must bear.” is our first erasmus+ project leading by our school.